Our work is to tell stories with sounds and moving pictures. It’s a great way to make a living, with plenty of chance to stretch our creative muscles. Mediaco-op is a workers co-op based in Glasgow, making ethical films and digital content for charities, co-operatives, NGOs and the public sector, plus the occasional TV documentary. The “creative industries” is the official label for our media co-op’s area of business. We like to be both creative and industrious, but our productions are more like hand-made, personally-tailored, one-offs than industrialised products. 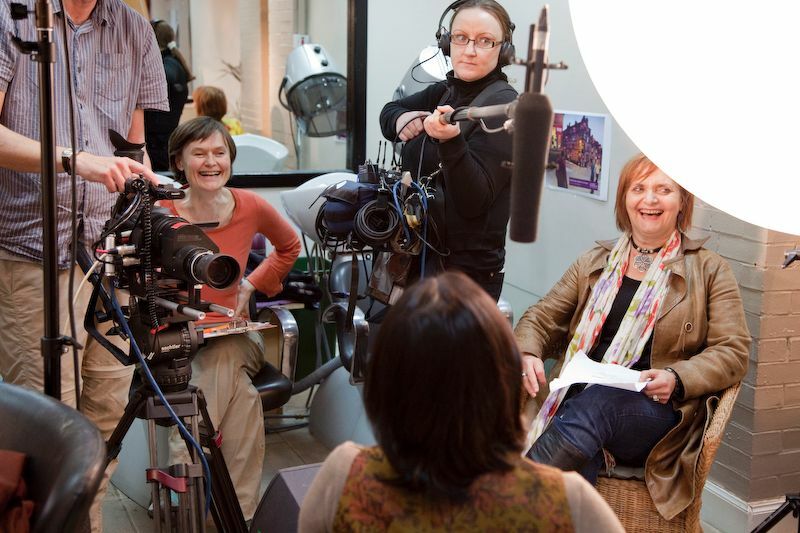 We’re not a women’s co-op, but the majority of us are women, and it’s important to us to have women in non-traditional roles: we often hire freelance camera women and female sound recordists; our in-house editor and post-production technician is a women too. The obvious place we have to be creative is in actually producing our films, animations, websites and other digital content. But creativity is more than on an on-screen thing for us. We specialise in participatory film-making, where our job is to not to come up with creative film concepts out of our own heads, but to work collaboratively with non-film-makers to liberate their creativity. Often we work with people who don’t think of themselves as creative at all, for example, teenagers leaving care and women survivors of domestic abuse. Right now we’re working with a group of refugees from Iraq, Zimbabwe, Algeria, Congo and Pakistan, to make four films in response to Scottish poems on the theme of ‘Home’ (commissioned by the charity, the Refugee Survival Trust). Our creative efforts go into crafting workshop techniques to unleash the participants’ self-expression and nurture their confidence, to feel their voices are worth hearing and they can master film-making tools themselves. Working with charities and NGOs, we also have to learn to be very creative with budgets; this was true even before the recession hit. Often our clients’ aspirations often go way beyond the resources they have available. We’re not prepared to drop our standards, we couldn’t sleep at night if we felt we were delivering shoddy goods. So when the demands are high and the budget is modest, what gives ? One way of visualizing this dilemma is the ‘fast / cheap / good’ triangle. The idea is that you can have two corners of the triangle, but not all three. So if you want it fast, and you want it to be good, it won’t be cheap. Or if you want it fast and cheap, it won’t be good. Or if you want it good and it has to be cheap, then you won’t get it fast. Our approach to making good products, at prices that are affordable to our clients, is to invest time with our clients at the beginning of the process. Sometimes it’s a matter of our clients finding out what it costs, to get at what they really want. Then they go off and raise the money. Other times we use all our creative ingenuity and tact to work out what they really need to achieve with their film or web clip. Digging into the back story of what the client is really trying to communicate, and how they’re going to reach their audience: that’s a creative and absorbing journey in itself…. before we ever get the camera out of the bag. Great to see the co-operative model being used in a creative industry. I loved this, feeling the same ‘pulse’ that compulsion brings to the heart to make films that say something. Passion for people and the messages that they want to bring to the world is a great asset in this business, and it shows here. For me, as a sole trader, I can see the benefits of this model in neon!!! Support, sharing goals, ideas, honing ideas, distributed skill-sets. It’s proof that ethics need not get in the way of healthy commercial media business and I’m inspired by this particularly.